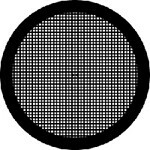 Grids - Holey Carbon Coated - Copper 400 mesh | Polysciences, Inc.
3.05mm diameter. Copper 400 mesh. Holey Carbon Coated. Useful for EELS (electron energy loss spectroscopy).